We seemed to cram in as much as we possibly could on our vacation. 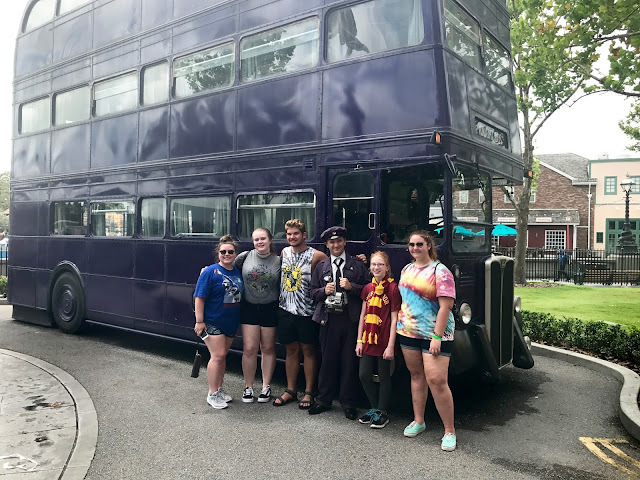 Hayley's friends were also there the same week and we were able to meet up with them and spend the day at Universal enjoying Harry Potter! 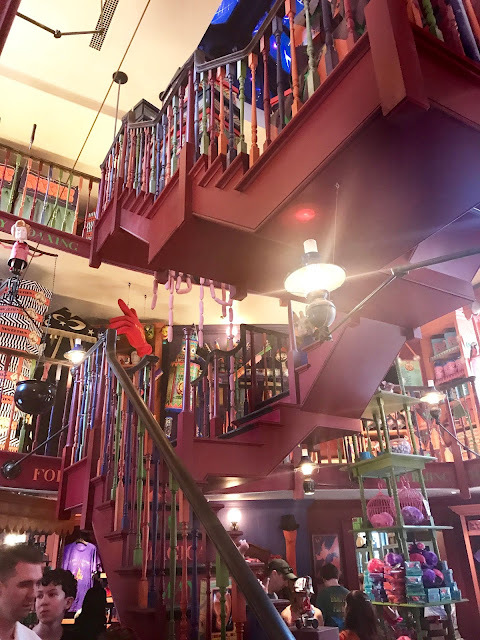 We were sure to visit Weasley's tricks and treats shop! A pretty neat place inside, though very difficult to move around as it was crowded and not much room to move. Pretty much all the places inside were the same as far as not enough room. 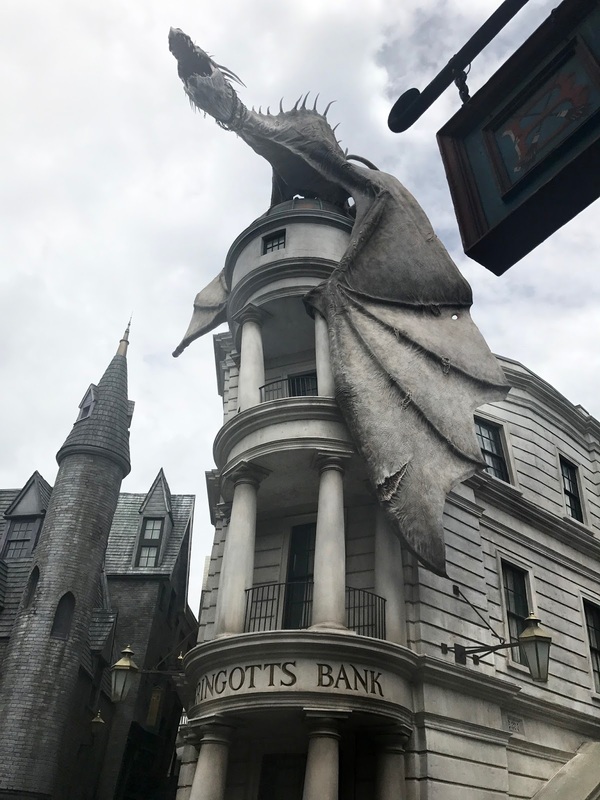 We waited in line for Gringott's bank and ride, which was pretty neat. Weather wise it was rainy most of the day, but it didn't stop us from enjoying ourselves and seeing as much as we could! I loved the chandeliers in there! So elegant!! The Quidditch store had a lot of interesting things too. 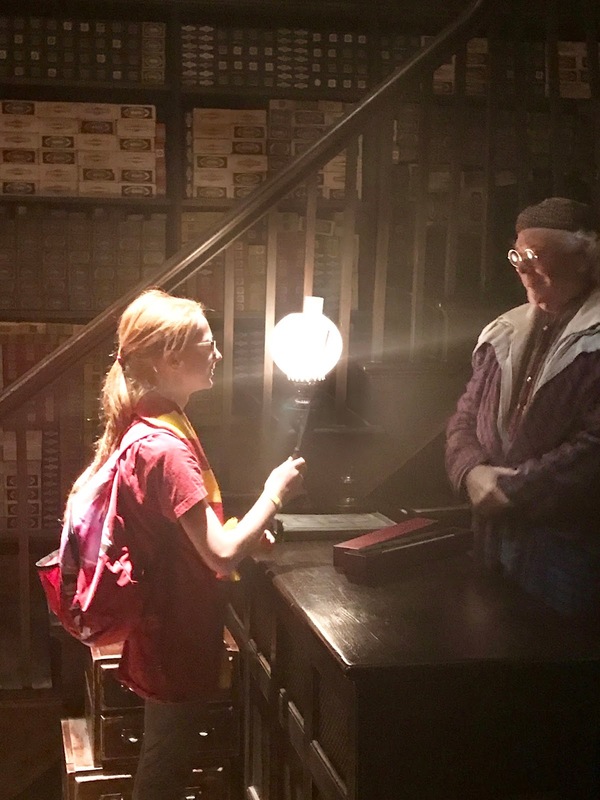 Kathleen was so excited to see the stories come alive in person. They did an amazing job recreating everything. 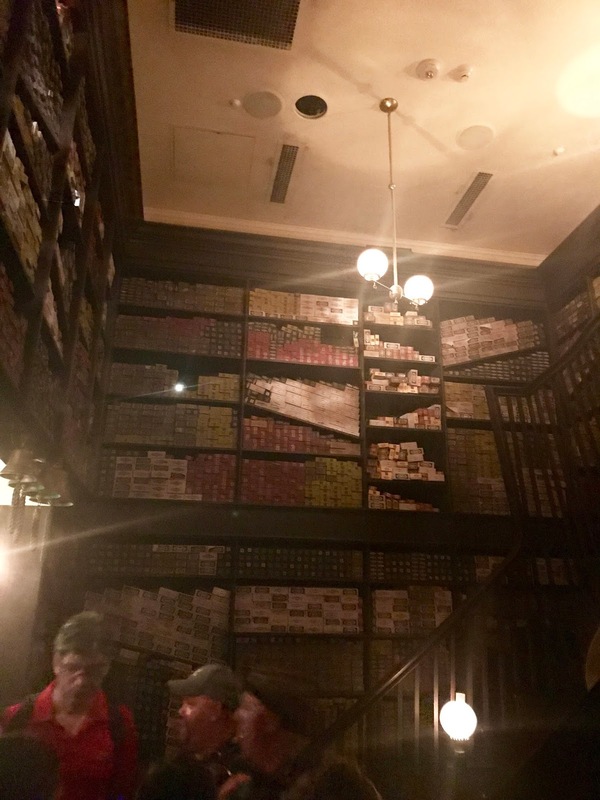 Ollivander's Wand Shop was a truly magical experience! 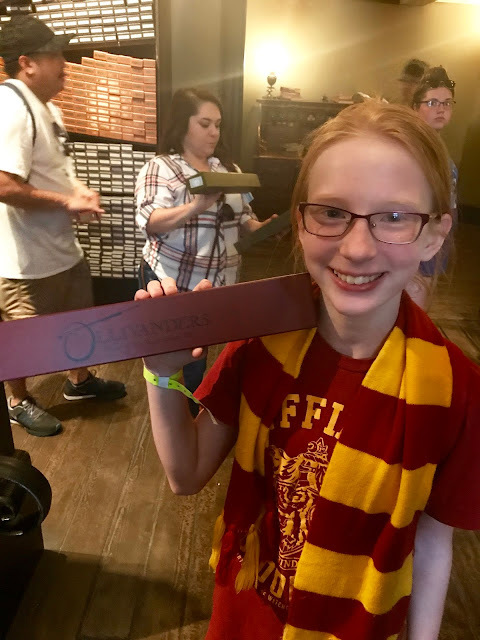 Kathleen had a wand choose her with a whole ceremony! I don't think the smile left her face for over a week :-) What a memorable moment! 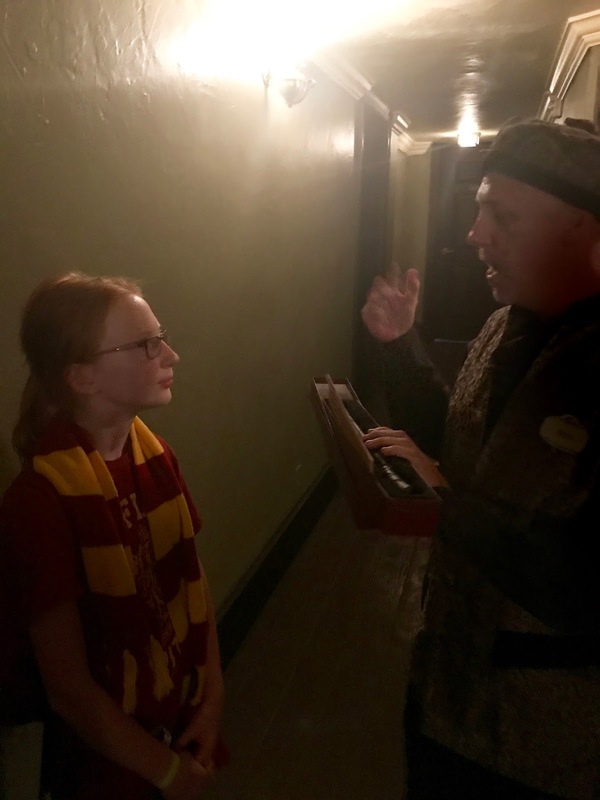 The wand keeper telling her how the wand chose her and all the things that were special about her. Then his assistant when we went out of the room was saying how he felt so drawn to Kathleen and her personality.... so much magic and mystery in the air! 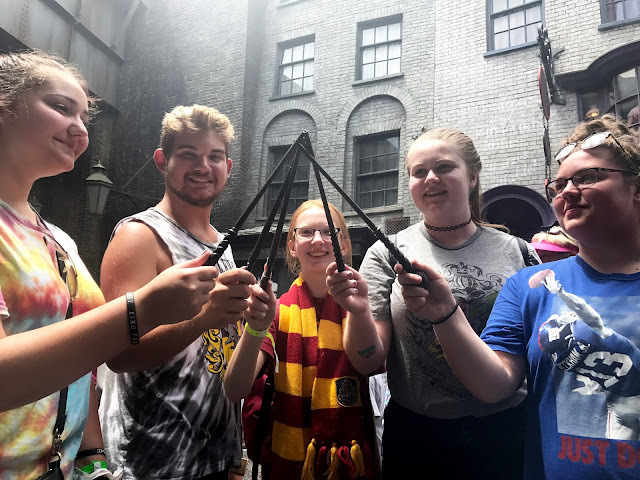 Our girls and Breanne and Hayley's friend Kyle and Allison who we met up with while we were there, were all enjoying their new wands! There were different locations where you could use your magic wands around the Harry Potter section. 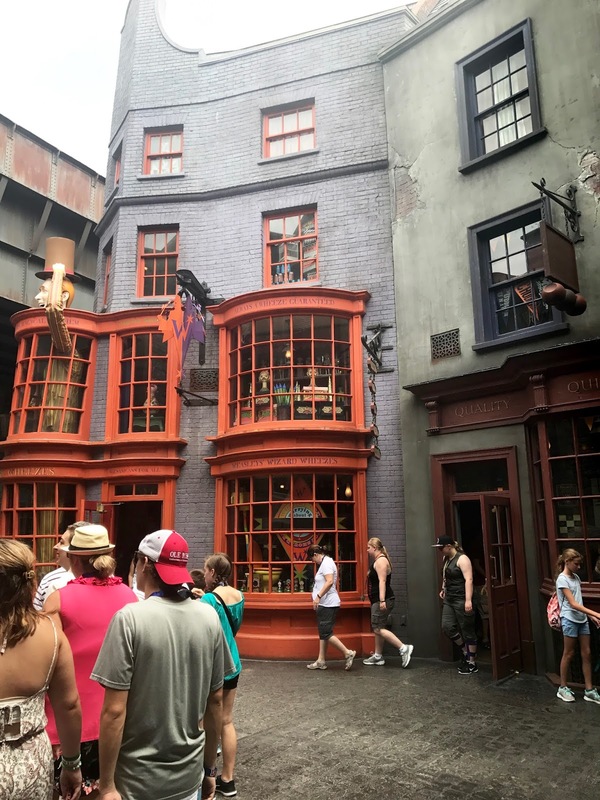 In this area the fountain would "magically" throw out water if you created a spell near it with your interactive wand. 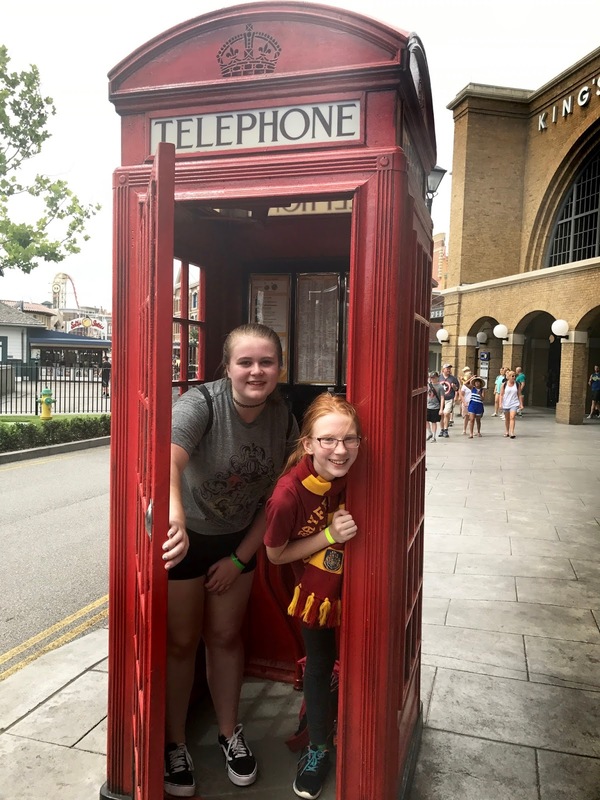 We took at magical ride on the train to Hogwarts! This was a really neat interactive experience also! Hogwart's ride, the kids really liked this one but Jerry and I didn't ride as we were carrying so many packages by that point and umbrellas etc. We decided to wait for them. We were all pretty drenched from the rain. Kathleen did manage to take some time to catch Marmaduke as we were leaving the park for the day! 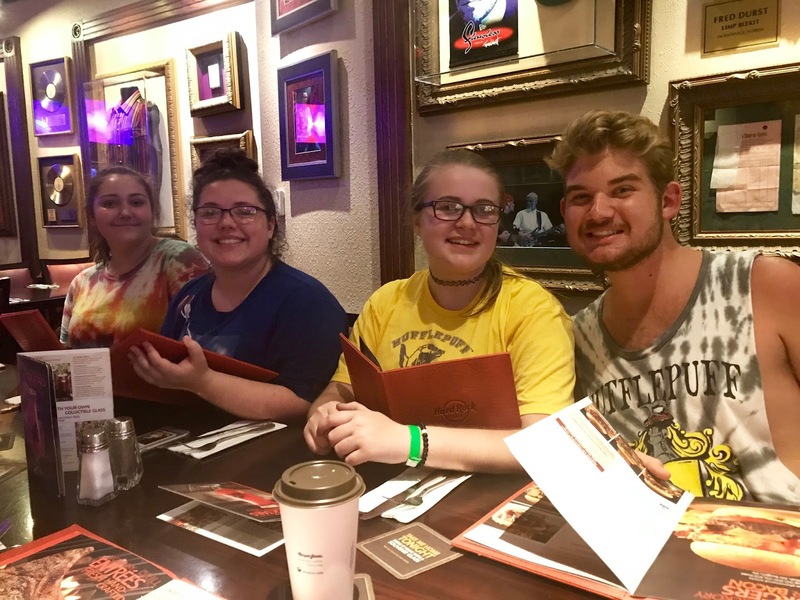 We had a wonderful, delicious dinner at the Hard Rock Cafe! Fabulous service too! Of course there was birthday ice cream too! Ok so the temptation of the cinnamon roles was just too great to pass up! Especially when you are walking by and they smell so amazing!! What a great group of kids and a wonderful day! We were tired but made lots of memories!! That is so awesome! Really makes the books come alive! You'll never feel the same after this experience! Enjoy your weekend! Thank you so much, Jill, for sharing about your vacation part 2. Our granddaughters would have loved to have been along! It looks as if everyone had a wonderful day! What a fabulous experience! Glad you enjoyed it so much!! Oh, I loved this post, Jill. 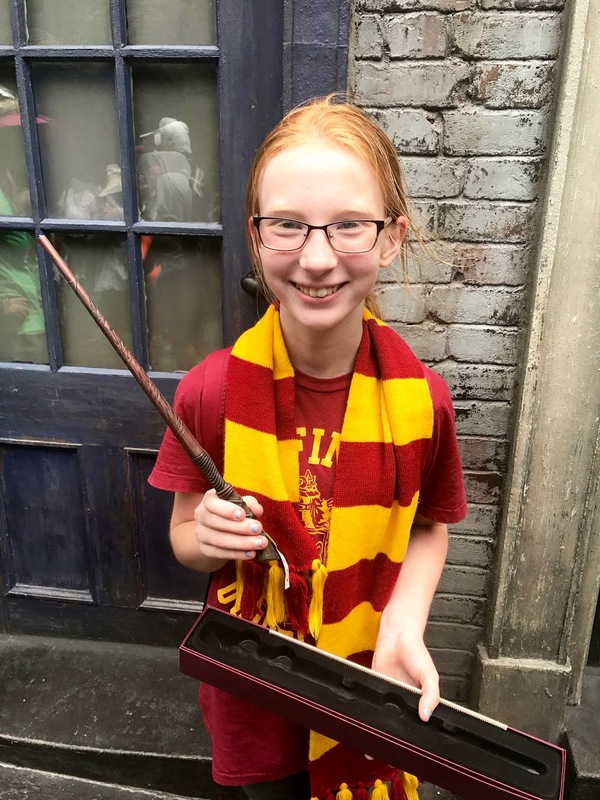 My kids LOVE LOVE Harry Potter, and I will have to send them over to see this. 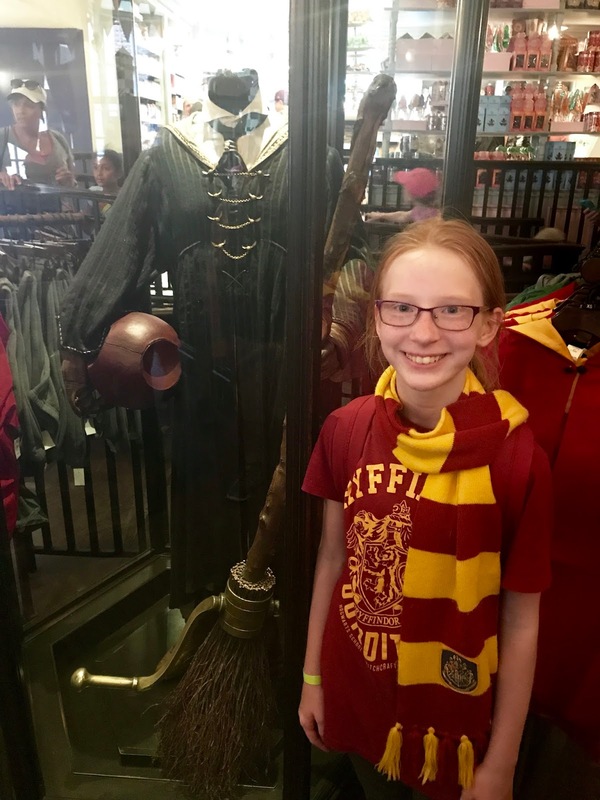 Kathleen looks so cute wearing her Harry Potter scarf, and Hogwarts Express sounds fun! Those cinnamon rolls look amazing. Love that picture of all of them with the magic wands. What a wonderful day at Universal. Just wanted to catch up with you Jill. Love seeing the photos of your fun trip! But mostly wanted to send you continued prayers and love during this difficult time. Thinking of you Friend. Oh.my.gosh! I love, Harry Potter! It looks like you guys had a great time! I loved all the photos, your girls are adorable little wizards! Hard Rock Cafe is one of my favorites, although we don't have one where we live. I have to travel to get my favorite burger! What a fun vacation!! and again, I'm so sorry about your loss. I'm so sorry for your loss, Jill. Jill, I just heard about your Mom. I'm so very sorry. You and your family are in my prayers and heart. Dear Jill, I am so very sorry to hear about your mom. She was such a sweetheart and I'm glad I met her through blogging. My heart goes out to you and my thoughts and prayers will be lifted for you and your family. My deepest sympathy. Sending you hugs and prayers. I just read about your mom.